This is one of my favorite figures from this figure line. A seat without legs. Interesting. Bounty hunters are pretty much prevalent in the Star Wars universe, although up until the computer animated series we had not really see them actually doing much. The rudeness of this shadow is a happy accident. There are surprisingly few laptop choices for action figures. Well, completing this Iron Monger figure took a little bit more work than usual. First off, Hasbro released in two separate waves the action figures containing the pieces to build the ‘monger. This would not have been much to think about, except that both half-waves were released about 6 months apart from each other. This time a stick is just a stick. Last but not least, I got this classic version of Iron Man, released as part of the Iron Monger wave of figures produced by Hasbro and sold under the Iron Man Legends brand. Well, it’s been some time since this action figure was released in the Star Wars 30th Anniversary Collection, but it was only recently that I finally got hold of it at a local convention. It’s always amazed me how many wrestling figures there are out there. Okay….this might appear to be the kind of toy you wouldn’t find here. But, it’s not. The subject of today’s review is one of the rare villains that I actually knew a little about from his brief appearance in the Secret Wars story arc, back in the 90’s. 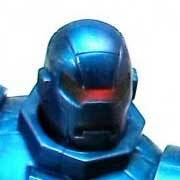 I am referring, of course to Ultron; one of the characters released in the second half of action figures in the Iron Man Legends line by Hasbro. You are currently browsing the TV and Film Toys blog archives for December, 2013.